Did your favorite teams win this weekend? Some of mine did, but some didn’t. It might be a tough year for me, but win or lose, fall is great for one thing alone: football! Okay, so maybe not just football by itself, but rather all of the things that come with it. Like food for example. 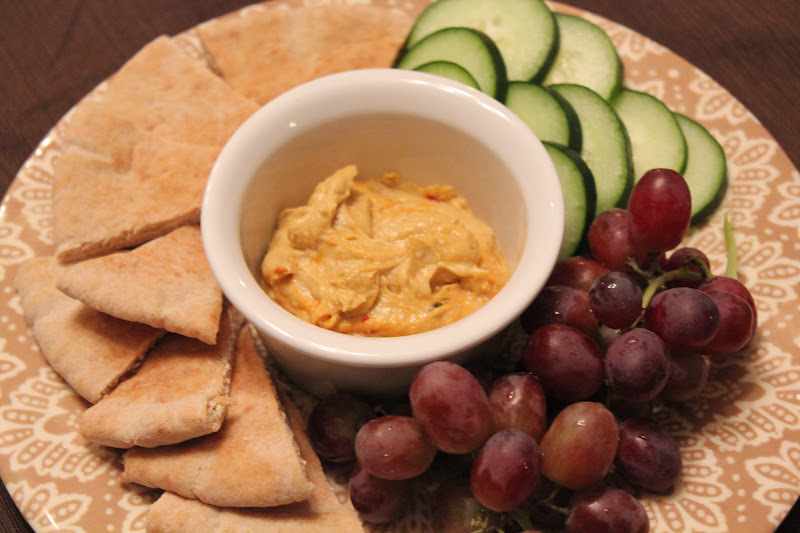 We had some company over to watch football Saturday afternoon so I put together a little spread including pita wedges and cucumber to dip in hummus, alongside some red grapes. That was the healthy plate. Then came grilled cheese sandwiches (after taking these pictures, I ended up cutting the remaining sandwiches into fourths for easier snacking). These weren’t your ordinary grilled cheese sandwiches though. They were kicked up a notch, inspired by the sandwich from Purée. 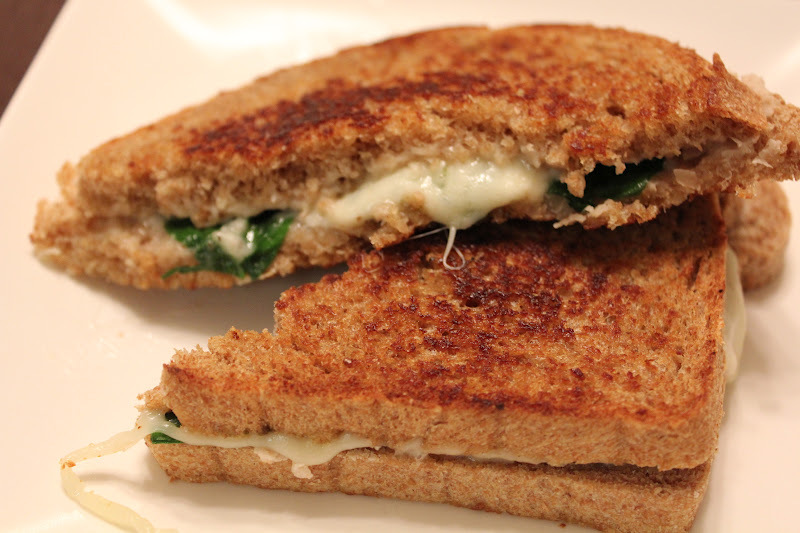 The bread is slathered with a white bean spread before being filled with smoked provolone cheese and fresh spinach leaves. 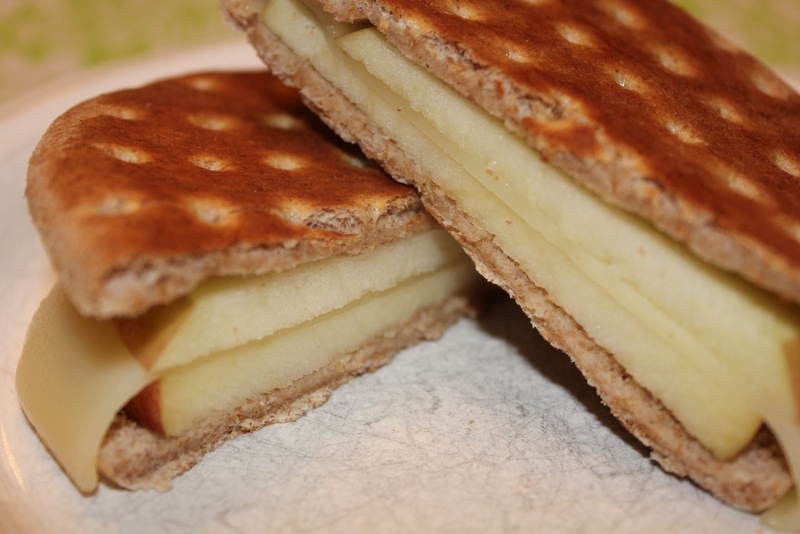 Then, of course, grilled on the stovetop for just a couple of minutes to get that cheese nice and melty. 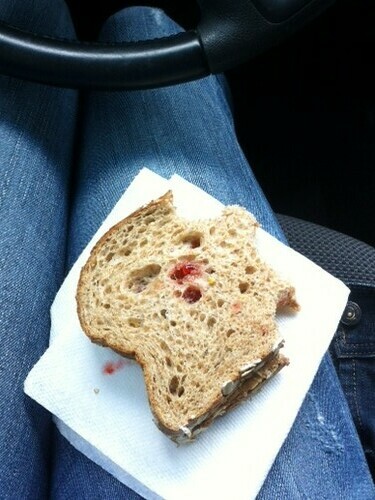 Not only was the filling of this sandwich amazing, but the bread deserves a lot of credit too. I picked up a fresh loaf of Honey Whole Wheat from Great Harvest Bread Co. on Friday (coupon for a free loaf!!) and haven’t looked back. I may or may not shoved a piece of bread in Greg’s face saying, “How good does this smell! ?” He says I’m weird. I say I’m….well, weird. 1. Prepare the white bean spread by adding beans to a food processor and blending for about 2 minutes or until beans are smooth. Add salt and pepper. Pulse a few more times to incorporate seasonings. 2. Heat large skillet over medium-low heat. Meanwhile, spread about 1/2 tablespoon of margarine on one side of each slice of bread. On opposite side of the margarine, spread about 1-2 tablespoons of bean mixture onto bread. Lay 4 slices of the bread margarine-side down on skillet (meaning the bean spread side will be facing up). 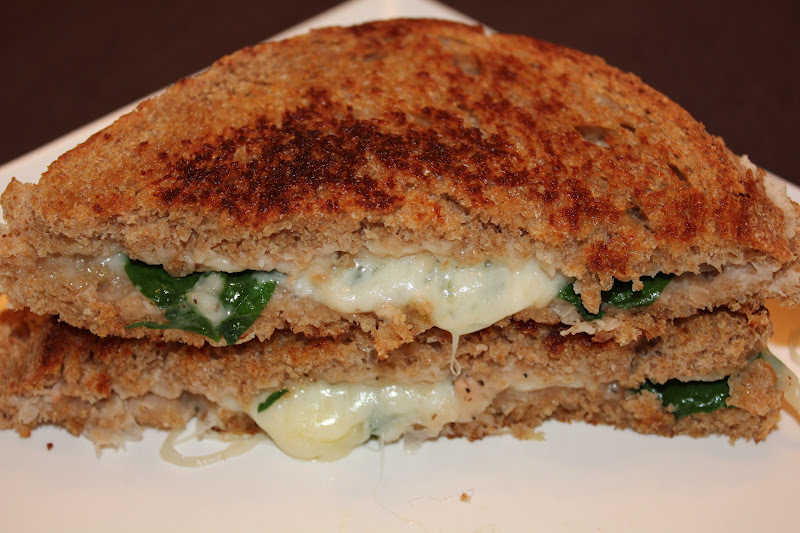 Top each of those slices with one slice of cheese and about 1/4 of the spinach leaves. 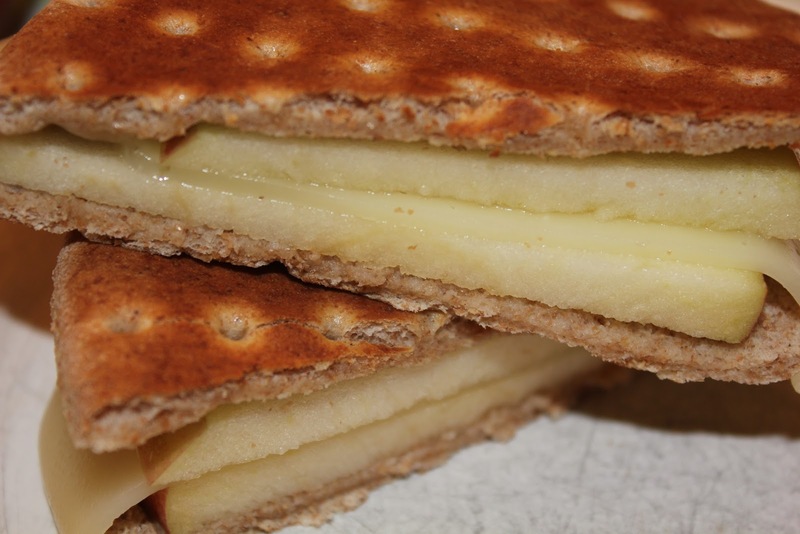 Lay a second slice of bread, this time margarine-side facing up, on top of the slices on the skillet. 3. Let cook about 3 minutes, flip and let cook another 2-3 minutes, or until bread is golden brown. 4. Remove from skillet, slice as desired, and serve immediately. It’s about that time for another WILW post, dontcha think? 1. Two nights in a row of cooking some of my favorite tried and true recipes. 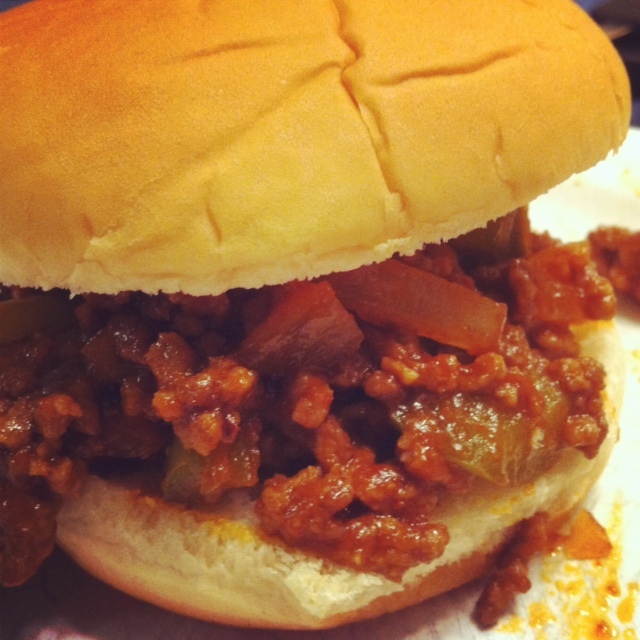 Sloppy Joes, that I’m renaming Super Spicy Sloppy Joes. I used less spice and hot sauce than my recipe called for and my mouth was still on fire two bites into the sandwich. 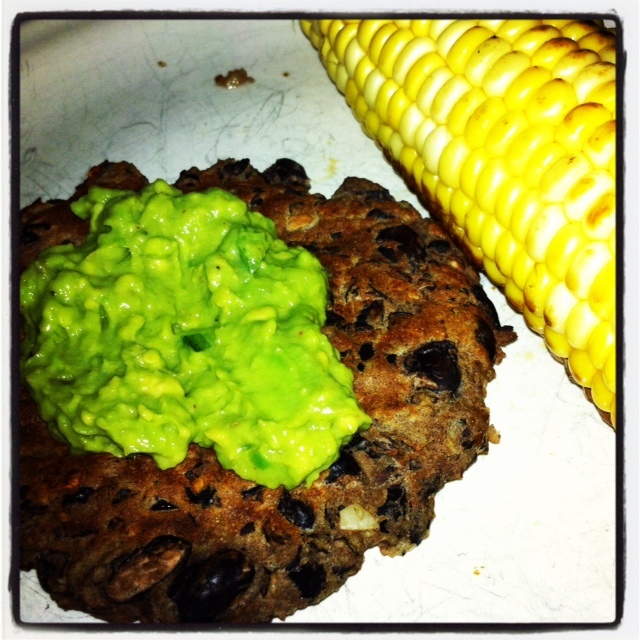 Morning Star Copycat Black Bean Burgers with homemade guacamole and corn on the cob? Ohmuhgosh. I could eat this every single night. 2. This. 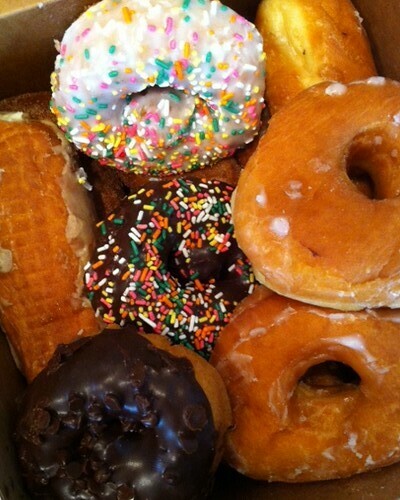 This is what I call Heaven in a Cardboard Container. 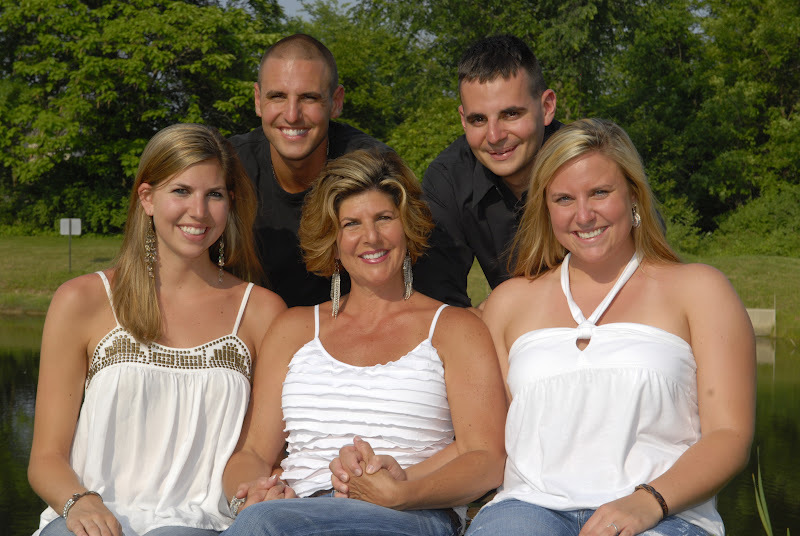 Have you tried any of Duff’s (aka the Cake Boss’s) Blue Bunny ice cream flavors yet? 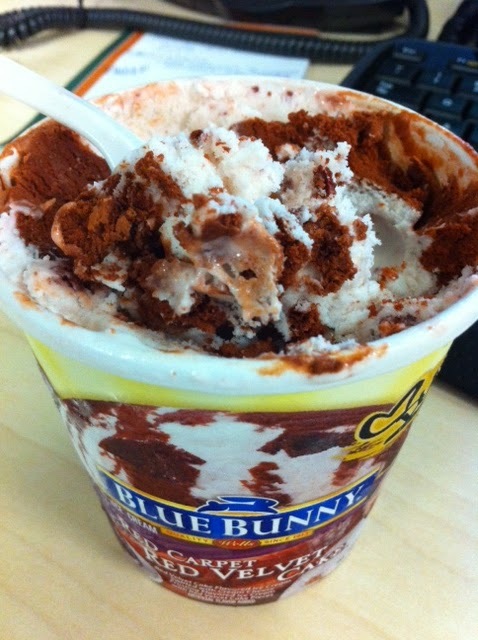 This Red Carpet Red Velvet Cake ice cream is to die for. I bought this on my dinner break while working a late shift last week and it’s safe to say this is only thing that kept me going at my desk until 10pm. 3. 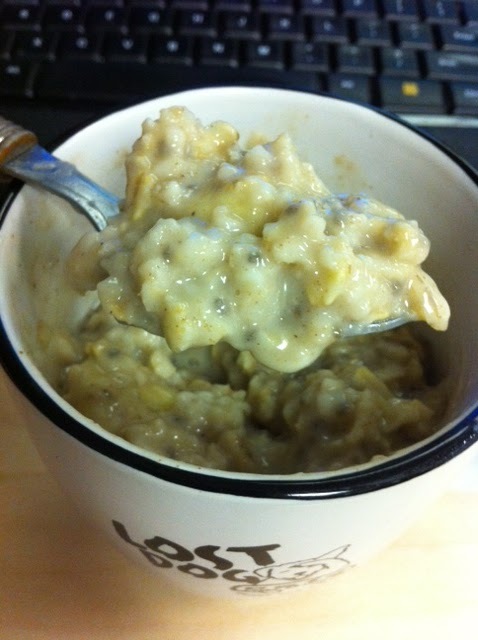 A coffee mug filled with hot oatmeal. Don’t forget the sliced bananas and chai seeds! This is how I’ve been starting my workday for the past two weeks. I’ve gotten in a poor habit of sleeping until the last minute and not having quite enough time to eat my breakfast at home. Solution? Bring my oatmeal to work in a mug! 4. Oh look, it’s my Lost Dog Cafe mug again! I sure do put that thing to use. 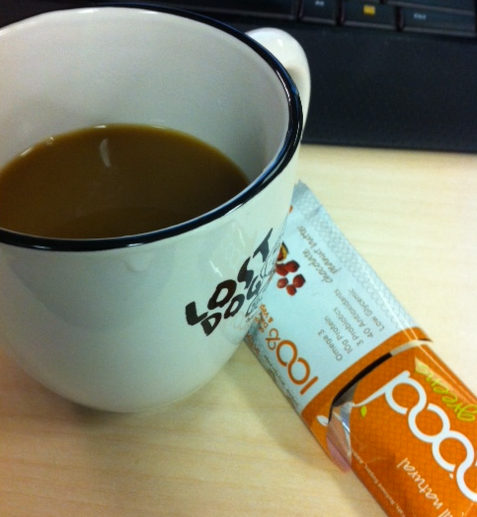 After cleaning the oatmeal out of it, I fill it with what it’s actually meant for- Coffee! These rainy days call for a warm and comforting afternoon snack like a hot cup of coffee and a chocolatey Good Greens bar (Chocolate Peanut Butter flavor). 5. Out of all of this foodie goodness, the thing I am loving most about this Wednesday is that it’s my last full day here in Charleston before my trip HOME!! Tomorrow evening, Greg and I will be hopping on a plane to Columbus for a full weekend of cake tastings, meetings with the caterer, engagement pictures and some much needed family time. I. Can’t. Wait!!!!!!!!!!!!!! For the second week in a row, Breakfast for Dinner was on the menu in this household. This time, the meal was much more savory than sweet. With a coupon for a free loaf of bread from Great Harvest, I walked into the store during my lunch break and grabbed a fresh loaf of Oregano Basil bread. I was so tempted to get the heavenly Cinnamon Chip, but I wanted something more versatile. The girl behind the counter recommend this herb bread and described it as extra soft, and similar to focaccia. Sold! (But not really, because it was free! Yay!) She had also mentioned this was the bread they use to make breakfast sandwiches. That’s when I knew it was really perfect. 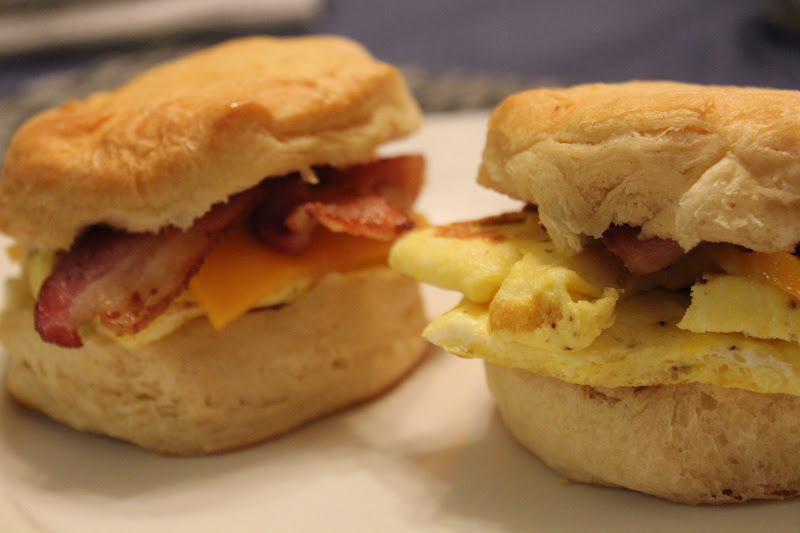 As much as I love a good sandwich for lunch, breakfast sandwiches can be pretty special too. 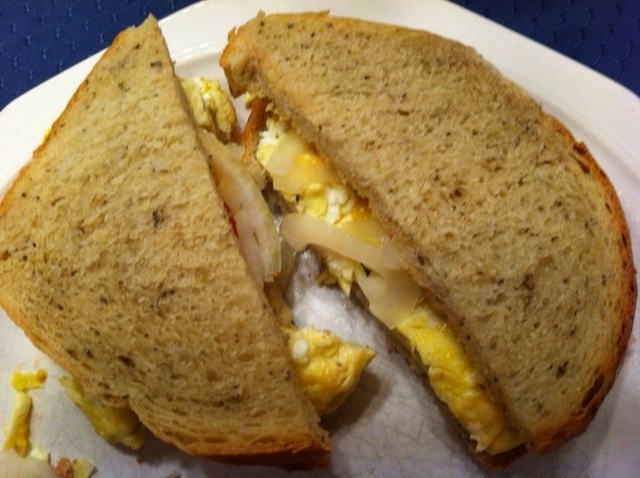 A breakfast sandwich sounded great for dinner, especially now that I had fresh bread to do it. I kept my sandwich very simple. Scrambled eggs mixed with a little shredded cheese, topped with sliced onion and tomatoes, pressed between two toasted slices of Oregano Basil bread. If you have a man in your life that can’t bear the thought of a meatless meal, bacon or sausage patties make good additions to the sandwich. 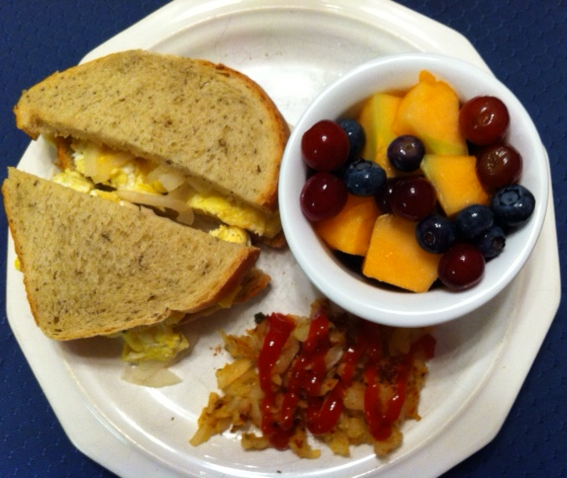 Need more inspiration for a breakfast sandwich? 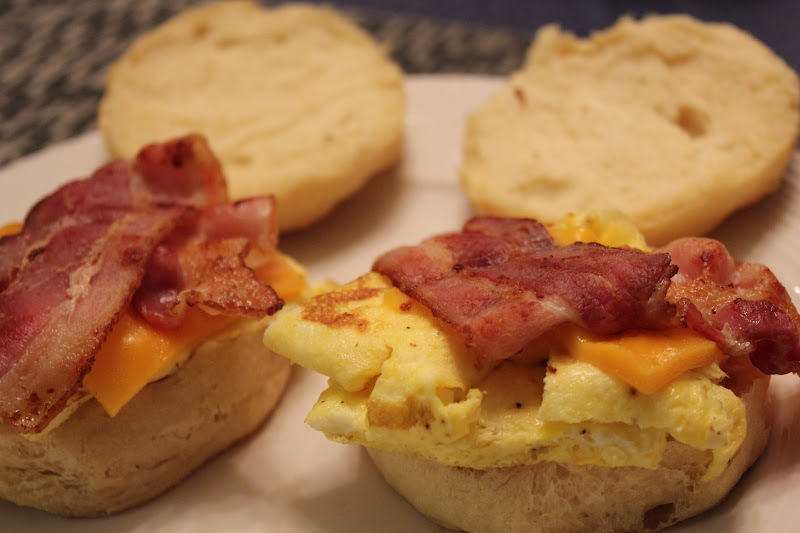 You may be interested in my homemade Bacon Egg and Cheese McMuffins. I couldn’t tell you the last time I ordered something from McDonald’s. That is fine with me, because I really want as little to do with it as possibly anyway. Whenever I hear the stories about people leaving a McDonald’s burger out for years and years and the food barley changes in look, it makes me want to eat a fresh green salad, extra veggies please. I was the princess of 6-piece Chicken McNuggets with sweet and sour sauce when I was a kid. Princess, I tell ya. And then there were the Sausage and Egg McMuffins which were pretty delish, until the McGriddles came along. OMG, sooo good on the tongue. But then I felt like I was going to have a heart attack after eating one. Not so good. 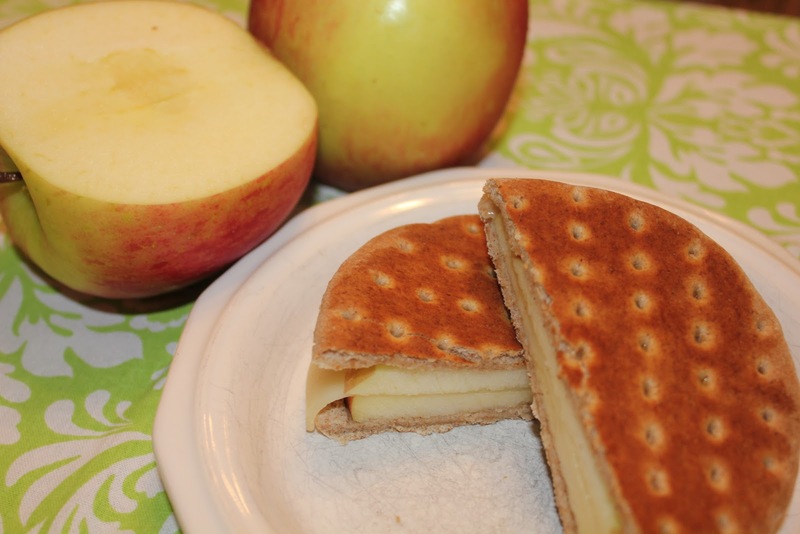 Now that my Mickey-D’s days are past me, I find myself missing those classic breakfast sandwiches. Every once in awhile I’ll make breakfast sandwiches on bread or bagels. After making Biscuits and Gravy this weekend, I was left with some spare biscuits. Perfect for a McDonald’s remake without the guilt…or heart attack. These add up to about 330 calories, which is about 100 cals less than McDonald’s. This is a little more than I normally like to have for breakfast during the week, but not unreasonable by any means. Plus, you know exactly what you’re eating with these homemade variety, whereas with McDonald’s who knows what you’re putting in your body. Not me. And I don’t really want to know. I like making my breakfast sandwiches with egg, cheese and any combination of ham, sausage or bacon. 1. Cook bacon according to package directions until crispy. 2. While bacon is cooking, heat another skillet over medium-low heat. Add eggs to a small bowl and whisk. Pour into heated skillet. Let cook about one minute. 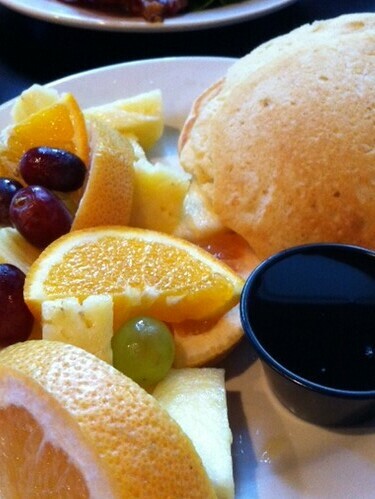 Scrap spatula around the edges to loosen egg from the sides. Fold egg mixture in half on top of itself (like an omelet). Continue cooking another minute, flip and cook one more minute. Cut in egg mixture in half. Season with pepper. 3. Split biscuits in half. Add half of the cooked egg to each biscuit, top with an ounce of the cheese, then bacon. Press down top half of biscuit. Serve immediately. What do you do after eating the same foods over, and over, and over and OVER again? You start feeling sick, that’s what you do. But with a fridge full of leftovers, I hate to waste any of it. Instead of throwing it away, I had to great creative. I admit, we really didn’t end up with too many Thanksgiving dinner leftovers. Probably the least amount compared to any other Thanksgiving in my memory. I tried to plan it this way and not go overboard with the side dishes. After splitting the leftovers with my family who took some back home with them, we mostly had some turkey, mashed potatoes and stuffing. I love lean protein like turkey, but it can definitely get old. So, for yet another lunch filled with leftovers, I put a spin on the dish that made it taste completely different. The tastes of Thanksgiving were nowhere to be found. 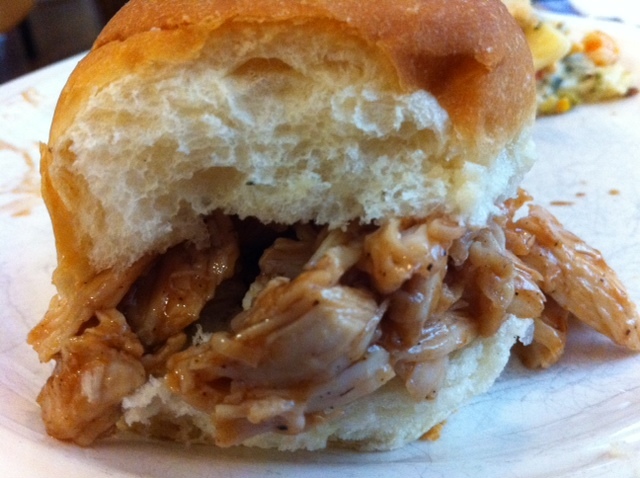 This BBQ pulled turkey slider saved me from the point of Thanksgiving leftover insanity. Just when I thought I couldn’t eat leftovers for another meal, the sandwich turned things around. Need a way to use up the mashed potatoes? Potato pancakes! I didn’t get a picture after making them for dinner last night, but just imagine thick, brown and crispy potato cakes topped with cheese. It really doesn’t get much simpler. I topped mine with ketchup too. 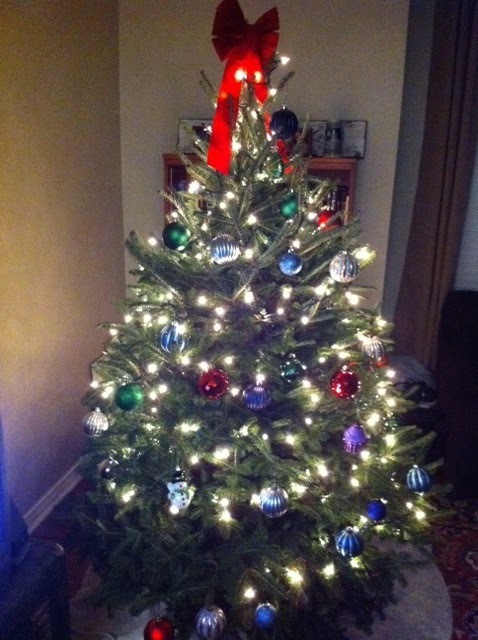 One last thing before I go: Our Christmas tree!!! I cannot tell you how excited I am about my first ever REAL tree. I am so in love with it! 1. If not already done, slice rolls in half. Quickly heat in microwave for about 5-10 seconds. 2. Heat turkey in a microwave-safe bowl for 20-30 seconds. 3. 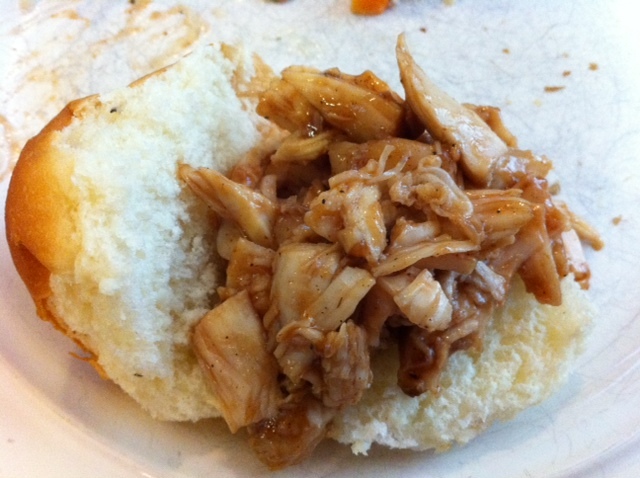 In a medium bowl, add shredded turkey and barbecue sauce. Mix with fork or spoon until well combined. 4. Place about 1/4 cup shredded turkey mixture on bottom half of each roll. Top with other half and lightly press down.